The Paynesville Area Public Schools made Adequate Yearly Progress in 2005-06, as required by No Child Left Behind and as determined by the MCA-II test results released in November by the Minne-sota Department of Education. The Paynesville Area Public Schools made Adequate Yearly Progress in 2005-06, as required by No Child Left Behind and as determined by the MCA-II test results released in November by the Minnesota Department of Education. Paynesville Area High School scored five stars in reading and three stars in math; Paynesville Area Middle School scored four stars in reading and three in math; and Paynesville Area Elementary School scored four stars in reading and three in math. Three stars are given when a school makes Adequate Yearly Progress (AYP), which was accomplished by all the local school buildings. Paynesville Area High School scored two extra stars in reading for having more than 30 percent of students score in the top level (exceeding standards) on the MCA-II and for having an outstanding performance compared to schools with similar numbers of students receiving free or reduced-price lunches. Paynesville Area Middle School and Paynesville Area Elementary School both earned an extra star in reading for having 30 percent of their students score in the top level (exceeding standards). Reading, according to superintendent Todd Burlingame, "certainly is our strong suit." "We'd like to see our math scores be where our reading scores are, where we have four and five stars," he added. It's "always a goal to get more stars," agreed elementary principal Deb Gillman, who also serves as the district's curriculum coordinator and its testing coordinator. The MCA-IIs were new tests, given last spring in late April and early May. Because they were new tests, they cannot be compared to previous MCA-I results. The consensus is that the new tests were harder. "Staff would say that," said Gillman. "Staff would say they were harder tests than before." Though test results are not directly comparable, to illustrate the more rigorous results, consider how Paynesville students fared on the MCA-Is in 2005 compared to the MCA-IIs in 2006. In 2005, in the 10th grade reading test, over 90 percent of PAHS students showed proficiency, as they led neighboring school districts in highest average scale score. This year, PAHS ranked second among neighboring school districts in average score, but the percentage of PAHS students showing proficiency dropped to 75 percent. In the 11th grade math MCA-II, only 31 percent of PAHS students showed proficiency in 2006, compared with 81 percent who showed proficiency on the MCA-I in 2005. In the elementary school, 91 percent of fifth graders in 2005 showed proficiency in reading and 90 percent showed proficiency in math. In 2006, on the MCA-II, their proficiency as sixth graders dropped to 77 percent in reading and 67 percent in math. Similarly, 81 percent of third graders in 2005 showed proficiency in reading and 77 percent showed proficiency in math on the MCA-I, while their proficiency levels dropped to 77 percent and 69 percent respectively as fourth graders in 2006 on the MCA-II. The MCA-IIs were harder even than the pilot tests that Paynesville students took, according to Gillman. The number of five-star schools in the state was cut in half in 2006, added Burlingame, and twice as many schools in the state were cited for not making AYP. 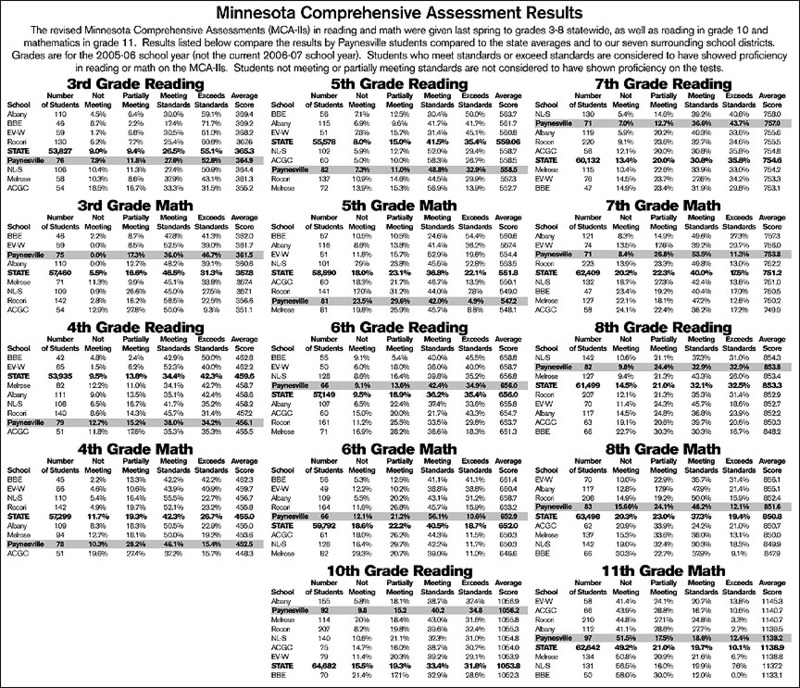 Paynesville students (see the charts on page 3) generally tested slightly below state averages in the elementary school (grades 3-5) and exceeded state averages in the middle school (grades 6-8) and in the high school (grade 10 reading and grade 11 math). Among neighboring school districts, Paynesville had the second best reading scores in grades 7, 8, and 10. Student testing - and examining the results, pinpointing areas to improve - allows school districts to be "much more purposeful in using data to make decisions," said Gillman. Test results and the inclusion of standards is now a focus on curriculum decisions, including choosing books for grades and classes. "It's what we should have always been doing, but we didn't always have the data," added Gillman. One benefit of the MCA-IIs is that now more data will be available to school districts. The MCA-IIs, taken in grades 3-8, will give year by year results without gaps, which was the case when the MCA-Is were given only in grades 3, 5, and 8. The standards tested in the MCA-IIs have been embedded in the curriculum for years, and now a focus will be to look at the test specifics and prioritize the curriculum to concentrate on the required state tests, explained Gillman. Cynics might call this "teaching to the test," but having good test results is important nowadays. "We're just more focused," added Gillman. "The bar is being raised. Everybody is trying to get better." One bright spot among the elementary test results is the third graders - the first class to attend all-day, everyday kindergarten - testing at state averages in reading and above state averages in math, the best showing at the elementary school this year. In math, none of the third graders were in the lowest category (not meeting standards), with all 17 percent who did not meet standards in the category just below that level (partially meeting standards). One of the goals of all-day, everyday kindergarten was to level the playing field, and having all the third graders close to meeting the standards in math is a good sign, according to Gillman. The elementary school is now in its third year with a new math curriculum, added Gillman, who expects that the full benefits of this new math series might be coming this years on the MCA-IIs, which will be taken again in late April and early May in 2007. The MCA-IIs are not the only testing done at the elementary school to provide data about student performance. Ames testing, now in its second year, is done three times per year (in the fall, winter, and spring) to identify how students are doing in reading and math. The data was given to parents during the recent conferences, showing progress, areas for improvement, and how students are doing compared to their peers. Breaking down topics, such as early literacy skills and math skills, can identifying areas that students need extra help. "That's the hope. That's the reason we're doing it," said Gillman. "To get kids help where they need it." Burlingame and Gillman said parents, students, teaching staff, and support staff deserve credit for curriculum improvements and the good test scores this year. While standardized tests provide a snapshot at learning, the school always hopes to do better, added Gillman. "We just keep moving ahead," she explained. "It's almost like you're on a journey. You can't always make big jumps, but you've got to keep moving ahead." Hopefully the district will make neighbors jealous with all our stars in coming years, added Gillman. Student achievement, after all, is what education is all about, agreed Burlingame. "We can't be satisfied or complacent, or all the school districts below us will jump ahead of us," said Burlingame. "We don't want to be the caboose."